A fully furnished and equipped detached home close to all the main attractions of the Orlando area. The major theme parks of Magic Kingdom, Epcot and Hollywood Studios are within 15 minutes drive. It is conveniently located for Interstate 4 which provides a direct route to Disney Springs, Sea World, Wet 'n' Wild and Universal Studios. It is within easy access, also by the Interstate, to Busch Gardens, Kennedy Space Centre, the beaches at Tampa Bay and Daytona and shoppers paradise at the Florida Mall and the Mall at Millenia. There are several golf courses nearby - with the Champions Gate course, designed by Greg Norman, within 5 minutes drive. 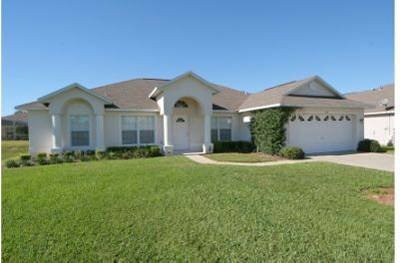 The villa is situated in pleasant rural surroundings to the southwest of Kissimmee, only 30 minutes from Orlando International Airport. It is tastefully decorated and furnished to a high standard and will sleep up to 8 people. All living space is fully air-conditioned for your comfort and the open plan layout gives a feeling of luxury and spaciousness. There is an alarm system installed for your security. Fully furnished and equipped and available for rental all year round. Bedroom 4 - with two twin beds, fitted closets,TV. The west facing pool and patio are accessed via the family lounge area or the pool bathroom. The 30'x15' swimming pool is fully screened and can be electrically heated, if needed, for comfort. It ranges in depth from 3' to 6'. The patio area has a table and chairs, including sun-loungers where you can relax and unwind. There is a removable child safety fence around the pool and alarms on the doors. Cot and barbecue facilities are also available. All local and long distance telephone calls are free of charge. (International calls are not available). Free broadband and WiFi connection. The pool can be heated if required for an additional weekly charge.